I'd been lurking on the Pinoy MTBikers yahoogroups for quite a while now but stayed anonymous for the most part...until they talked about the Bataan Killer Loop: 6-hr, no-newbie ride along a forest trail with some river crossing plus single tracks and a long downhill. I felt my heart throbing with the thrill of the ride. I advanced my ferry fare (through the kindness of Biker X) and started packing. The trip filled with uncertainty with a storm forecast. I wasn't sure if the trip was pushing through. On ride day, at 2:30 am, Biker X, my lone contact with the PMTB texted me saying he's not coming but assured me there will be a few who will go. It was discouraging, but I didn't want to forfeit the P300 I had already advanced...yeah, at that point, it was my advance ticket I was worrying about. However, the weather in Metro was fine at 5 am - it was a go for me. I loaded my bike and headed to the ferry station at CCP to meet up with the rest of the PMTB riders. I didn't know anyone. It didn't take long for me to warm up to my new riding buddies. Like most mountain bikers, they're totally chill and open to new riders. We boarded the ferry and spent the time shooting the breeze. It was good to catch up on the local mtb ongoings. Upon disembarking from Orion, our destination in Bataan, we pedalled to hook up with some Bataan Riders and off we went towards the mountain. We were about 20 minutes into the dirt trails when it started raining. Suddenly, the packed trail became molding clay. It wrapped around our tires like python on a sucking pig. Our momentum came down to a screeching halt. Not only were the trails not rideable, we could not even push our bikes. The clay around our tires won't even go through our forks and seat stays. It was also wishful thinking portaging them - with the weight of the clay, our 28-pounder weighted like an anchor. At that point, it became an academic decision to turn back. We changed our destination to Mt. Samat instead. It's the site where Filipino and American forces took their last stand in Bataan. It was a paved but steep road to the top. MountGuitars and I were close to the top when it started raining again. With the promise of hot coffee waiting for us at our host's place, the group decided to head back. The ride back meant downhilling on paved winding road in the rain. I kept reminding myself the increased danger but couldn't hold back. I ultimately aero-ed my form and let it rip following Brionne who seemed to relish the wind and rain on his face. Feathering the brakes just enough to negotiate the turns was a real rush. Fortunately, we all made it down in one piece. A sumptious serving of homemade pancit malabon and puto awaited us. E-Boy's wife and in-laws were our gracious hosts. They likewise offered their bathrooms for us to get cleaned. Brionne, ignoring fatigue and hunger, got our bikes cleaned - a gentleman was in the house. We left their house fresh from the shower. The ride back to the ferry was without incident. Shortly thereafter, we were safely back in Manila. It could be construed that the ride fell short of its promise. Well, things happen and the weather offers no guarantee. That's just a small part of the bigger picture. What's priceless is being able to connect with the community and riding with the awesome crew of PMTB and B.A.T.A.A.N. The Killer Loop will always be there and the promise of a another ride with these cool riders is always in the horizon. (16 Sep 2005) I was reading your website and it is pretty good set up. You don't know me, but I was a contributor at PinoyMTBikers and had ridden with Oilman and Diegs at Quinauan Point in Bataan. It's great riding with those guys. If I'm not busy I would like to go there and ride with you guys. 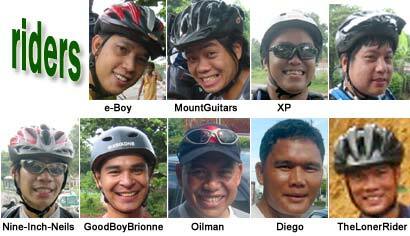 (12 Sep 2005) you must be a professional photojournalist bro, ur in depth coverage of the KL ride in Bataan was great. it makes all those who read it wish they joined the ride. tnx for the aricle. (11 Sep 2005) what an amazing website. you've covered every detail of the KL ride. how i wish the ride could've been successful. anyways, we'll schedule a better ride next time and most likely, just within metro manila's reach (reachable by pedalling). hope to see you soon and more power and success to you bro.